Israel Matzav: After being branded a traitor by the White House, why isn't Schumer coming out fighting? After being branded a traitor by the White House, why isn't Schumer coming out fighting? 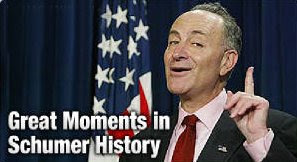 All sarcasm aside, this could be a great moment in Chuck Schumer's history. The real question is, why isn't he pushing to make it one. Branded a traitor by the Hussein Obama White House (along with other Jewish legislators who have come out against the Iran sellout), Schumer has remained curiously silent since announcing his principled opposition to the Iran nuclear sellout. He wasn't on any Sunday news shows (hard to believe he wasn't invited), and there have been no reports of him trying to influence other Senators to oppose the deal. Why? This is from the second link, by Seth Lipsky in Haaretz. So why, in the light of all the burning bridges, hasn’t Schumer launched a full campaign to block this deal? Why hasn’t he hit the talk shows and done what the Senate leadership is supposed to do to, well, lead the Senate? That would normally mean twisting arms, bargaining, and trying to get wayward or undecided senators to vote their way. Or even attempting to change the minds of those who have come out on the other side. The way this is being retailed in New York is that the Senator is prepared to talk to anybody who asks. He himself has characterized it as a vote of “conscience” (unlike the other votes he casts), a situation in which one can’t twist arms in the normal political way. There are those I’ve heard from who find that line unconvincing, to say the least. After all, if it were a matter of conscience and even a life-and-death situation for America and Israel, wouldn’t one feel impelled to spare nothing? Experience suggests, at least to me, that the big danger is a last-minute dodge, like the waiver Congress gave the president to avoid moving the American Embassy from Tel Aviv. Schumer was in the thick of that default. Could there be a waiver or some maneuver now to defuse the constitutional crisis between the Senate and the president over Iran? Maybe there’s a good reason for Mr. Schumer’s silence — he’s on vacation, he’s under the weather, he’s plotting. But if he’s really committed on this, the logic would be to re-engage. This just isn’t a time to stand on ceremony. Or perhaps, Schumer still wants to lead his party in the Senate and has silently cut a deal with the White House that he will not lead opposition to this sellout, and in return the White House will call off its minions when the time comes for the vote on a Minority Leader? And about those other Jewish Democrats who stand accused of treason by the White House, this is from the first link - Adam Kredo at the Washington Free Beacon. Given that Sen. Schumer seemingly went along with abdicating his responsibility re the Senate Treaty Ratification provision of the U.S. Constitution, this man is playing his part in wrecking the future for our children, grandchildren, etc. on this planet. The Constitution is what has made the US an engine of betterment for standards of living around the world. And, for whatever his personal preferences, Sen. Schumer is eliminating it. Since he would have to assemble 67 votes to oppose under this Corker bill, rather than only 34 to block it under the U.S. Constitution... the fix is in, and Schumer has short sighted cover. He is selfish, as are the Israeli recipients of $$BBillion os Gaia Fraud $lu$h, doled out as euthanasia by the same Obama/Clinton/KhmerRouge Kerry Posse arming up Terrorist Iran, Hezbollah, etc. How the events of WWII happened, which I never could get before, is now crystal clear. This is how Obama plans to proceed with an ethnic cleansing of Jews from the Federal government. Anyone who disagrees with the official policy will be branded a traitor and driven out. Soon there will be loyalty oaths that specifically call for vocal support of antisemitism in order to keep your job in the government. All these undercurrents are only going to hurt voters and citizens in the end. Doesn't seem like there are going to be removals of the doubt for a long while though. We just have to make sure we make an informed decision!